What PowerPoint to Video System Requirements? How records the sound into output video file? How improve the quality of output video? How to set the rect of output video? How to burn the output video to VCD/DVD disc? Where are the output video file? What are the differences between trial version and registered version? How to register this software became a registered version? How long receive the licence when I have order the software? I have some other questions. Who can I ask? Step 1: Confirm that have a sound card in your computer. Step 2: Install driver program for sound card rightly. 1. Right click the Speaker icon in the Taskbar (right bottom corner of your screen) or through the control panel. 4. Scroll down and right click "Waht U Hear" item (or "Wave Out Mix","stereo mix", "mono mix" or something like this, the exact name can vary), choose Enable. 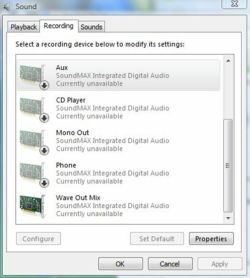 If you cannot find the "Wave Out Mix" item ( or something like this ), you need install the dirver program for sound card rightly. Setp 5: Check on "Record Sound CheckBox". Setp 6: Select sound card in "Sound Device" Combobox.If your system is Win98/2000/XP make sure your sound card name selected. If your system is Vista, make sure Wave Out Mix is selected (It's sometimes called stereo mix, or mono mix). Setp 7: Select input source in "Input Source" Combobox. If your system is Win98/2000/XP make sure Wave Out Mix is selected (It's sometimes called stereo mix, or mono mix). If your system is Vista, make sure any one item is selected. Setp 8: Click on "OK" button. Close other software when recording. PowerPoint to DVD all-in-one burn the output video to DVD disc. The default setting is "C:\", so you may find your video file in the "C:\yourppt_001.avi". you can change that folder in the "option". In trial version, there will be a text on your output video, and you can only use this software within 15 times. And if you have the registered one after you paid for it, we will always provide you the free upgrade to our newest version and the best after sell services. We would reply to you as soon as possible.